Our intent here is not to shoo you away from the skiing sport, but to make it more comfortable for you to enter and be in it, knowing how to behave. Not everyone will agree with these skiing ethics, of course, and some will even violate the legislated laws and industry codes. Many ski areas have personnel on the slopes for the purpose of reorienting such persons to more civilized behavior (or even removing them from the slope population). For the rest of us it is usually best to use avoidance as our tactic when we observe unethical situations. A report to a staffer is appropriate if significant infractions are witnessed, however, with details of the incident and a description of the offender. Although we deal with skiers here primarily, these notions apply to all slope riders. When you see crossed poles, stop. A hazard or a downed skier may be below. Poles or skis planted crossed in the snow mean the same. Note again that this website does not offer legal advice but recommends consulting an attorney in legal matters. Ski laws generally place the burden of risk on the skiers themselves, with at least this notable exception: they may sue others if they are damaged by a collision caused by another and they may be sued themselves if they are the cause of the collision. Criminal penalties may also apply. So, just as in driving a car, it is essential to understand the "rules of the road", or ski hill. For some applicable ski laws (not all), see agreement, which is where you agreed to conditions for using this website. 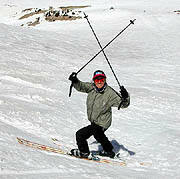 Also review Colorado's Ski Safety Act and Attorney General and Sheriff's Warning. When you go to these pages, you will need to agree again to the site conditions to return here. Add item 7, "Know how to use the lifts safely." 1. You or someone else will lose control, but if you have learned well and are at a slower speed and/or have kept a distance between yourself and other skiers or objects you may avoid disaster. 2. It may be unclear who is ahead, or even where on the slope "ahead" is. Or maybe neither skier is ahead, yet turn into each other from opposite sides. Snowboarders have a "blind" side and cannot always see who is approaching them from the back, so give extra room in such cases. 3. Perhaps you did not intend to stop, but fell and now you are in an unsafe place. Get up and away as soon as you can. If with a friend, have them stand out of harm's way where they can be seen to warn oncoming traffic. 4. Again, just as it sometimes is unclear where the slope "ahead" is, it may be unclear where "uphill" is. If so, yield anyway. So far as slope traffic is concerned, ski defensively, not offensively. 5. Sometimes straps come loose or braking devices jam, so if a ski comes off and it is still with you, place it on the snow so it won't get away, perhaps upside down on the binding until you can get it back on your boot. If your ski runs away, shout "SKI" to warn others. 6. Because "everyone else" goes under the rope closure, you do not earn the right to do so. 7. If you don't know how to use the lifts safely, find out before boarding. Know how to get off, too. Have your ski pass ready for scanning: This keeps the line moving, so it may be smaller when you come down for your next ride. Avoid stepping on others' skis or boards: This is especially important if they look shiny or are attached to big people. Moving ahead of others in lift lines will make you unpopular: This applies even if the powder's up, and also for children, who can get very anxious to get up the lift so they can ski down again. Check signs at lane entrances and respect them: Some lifts have lanes for different classes--ski school, ski patrol, upgrade tickets, etc. Even if no separate lane, if an official asks for permission to move into the line, respect that. Lift personnel and ski patrol need to spend their time working for you, not waiting in lines; ski school needs a certain amount of skiing time to get all of the product they have paid for; race competitors need to get to the course start on time or be disqualified. Alternate with others: When multiple lines converge to the lift, alternate entry with other groups as the lines merge. Allow for special situations. A first-time skier or a handicapped skier might ask to limit the number of persons on a chair so they can be more sure of a successful exit at the top. Wait for or ask for instructions: Know how to load and unload from a lift before you get on. Load the lift with as many people as it can take: When a lift line is present accept strangers as needed; mix skiers, boarders, etc. Allow others to ride with certain people or an unfilled chair: Cases might include parents with small children, disabled persons, first-time riders. When boarding a lift, have pole straps removed from wrists: In case the poles tangle with the lift, you won't be caught. Ensure there are no loose articles of clothing, strap packs, or the like that might get caught on the lift (even long hair can be an issue). Have a good grip on clothing and equipment as you ride the lift. If you drop a pole or other piece of clothing or equipment, note where you dropped it along the lift line (most lift towers are numbered). Then go back for it if in an area you can safely reach. If you can't safely get there or if the area is closed, contact the lift operator or the ski patrol and await a time when their work schedule allows them to retrieve it. Use restraining bars if present: It's a lot "cooler" to use the bar than to fall from a lift. Some bars have foot rests, which take pressure off feet in tight ski boots. When you position the bar, advise others first so they don't get hit on the head or pinned. Even so, don't lean on the bar; sit well back against the seatback. Keep children back, too; the little ones might slip right under the bar, usually designed for bigger people. If there is no bar, sit well back on the chair; you might even hang on to a handle or drape an arm over the chair back. Advise your mates when you are approaching the unloading point and the bar needs to be opened so you can get off. Avoid clacking your skis together: Sometimes the shock causes a binding to release and if so, likely your ski will fall off. In the best case, at the top you will have to alert the lift operator of your problem (wave, shout) so the lift can be slowed or stopped as you hobble off and then follow the retrieval advice outlined above. In the worst case, your ski could fall on someone; you would likely be liable for any injury. Dumping snow from your skis onto persons below the lift is wrong: Not only is it not not nice, what if you accidentally dropped a ski on them? Avoid standing under lifts: See the 4 items above for why. If riding in a gondola, you normally remove your skis and place them in a pocket on the outside of the car, taking your poles inside. But sometimes you take your skis in with you, too, or maybe they won't fit in the outside pocket, so look ahead at prior boarders before boarding and see which procedure applies. In the larger tram cars you normally take your skis and poles inside. Sometimes lifts stop: Perhaps a person had trouble loading or unloading and the lift was stopped temporarily to give time to clear them. Or there could be a mechanical problem. Most lifts have back-up motors so operation can be resumed. Some lifts may be run backwards on occasion. Your only choice is to wait for the lift to start again. If it does not, then if not a surface lift, you must wait for an attendant to come along and advise you and perhaps lower you to the snow with equipment and ropes; ski patrols are trained to do this in the rare cases when necessary. Swinging your chair by swaying to and fro or even by swinging your ski tips up and down causes other chairs to swing also: This is disconcerting to some folks. And the overhead cable might twist free from or jam in the rollers; possibly swinging chairs could bang into lift towers and occupants could be jarred or worse. Such things have happened. Unload a surface lift where you are told to: Usually you will unload at the top. Likewise, ride in the established track. Both these practices help keep the overhead cable well in line with the rollers so it stays overhead, a good place for it. When you get off the lift, exit the unloading area: Others need room to get off, too. This is a partial list: Observe your surroundings and adapt to the applicable procedure, keeping courtesy and safety paramount. 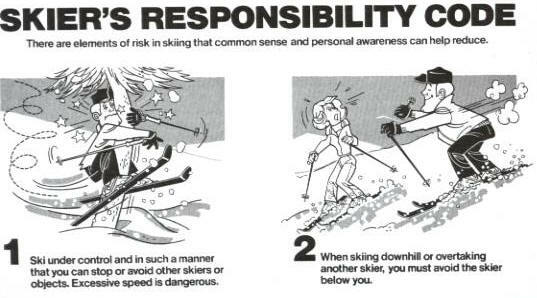 Follow the Skier's Responsibility Code: See just above. Ski on slopes you can manage and remain in control: Carry a trail map or inspect the map signs on the slopes to pick your terrain. Check the grooming report. Know the meanings of the green/blue/black slope ratings at the ski area where you are. If you err and get on a slope you can't handle, it's better to ask for help; a ride in a rescue sled down the mountain before you get injured is better than one afterward--for all concerned. Taking your skis off and walking down may not work, for the snow may be too soft to support you (that's why skis were invented in the first place) or hard and icy so that your hard-soled ski boots slip. Avoid getting your friend or mate or child on a slope they cannot handle: This happens commonly. Would you want to feel responsible for an unpleasant experience--or worse. Avoid teaching your friend or mate or child or parent how to ski: Unless you know how to teach skiing, you are almost certain to start them off wrong (being able to ski well does not qualify you as a ski instructor; neither does having taught 5 or 10 or more years ago). 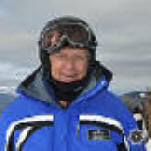 Notice what word comes first in the phrase Professional Ski Instructors of America; it's there for an important reason! Avoid sudden stops or moves into the paths of other skiers: Although you may be downhill from other skiers and therefore may have the right of way, if you have been skiing with a turn shape and/or speed that have been consistent, others may expect you to continue to do so and not be able to avoid you when you change your pattern. Check upslope for space before making radical moves. Why go to the first aid room knowing you had the right of way? Choose a turn shape and size that is consistent with those being used by others: Where the slopes are crowded, a medium-radius turn or less is usually best. Again, before changing your pattern (i.e., changing lanes), check that there is room to do so. Provide ample room when overtaking slower skiers on the slope: It's best not to alarm slower skiers, which might cause them to do an abrupt avoidance maneuver that results in a fall. Lower level skiers, especially, sometimes react to faster skiers, not yet understanding that speed and control can go together. Be aware that upper level skiers can ski at higher speeds in control: Lower level skiers should learn the difference between fast skiing and controlled fast skiing, as not all fast skiers are a threat to them. Children skiers can make amazingly sharp turns: Besides, they are little and harder to see--and you would not want to fall on their little bodies or fall yourself trying to avoid them, so give them space. Leave some space on the outsides of your turns against the edges of ski runs: Although you may have the right-of-way, other skiers may attempt to slip past you. If forced with a choice, would they rather take a tree out or you? When passing another, leave adequate room: In the old days, some shouted "Track right" or "Track left" or "On your right" or "On your left", but hardly anyone does this anymore, and so the odds are against the person who is being warned to know what those words mean. Besides, any skier ahead of you has the right of way, and you are supposed to avoid them. In a desperate situation you might make some kind of noise so they know where you are and help you avoid them, but it is still the passer's responsibility to miss the one being passed. Give help if a skier or boarder is down and shows no signs of getting up: If the downed person is injured and you have first aid or medical training, you will know your capabilities, but in no case should you exceed your knowledge in assisting an injured person. An early priority would be to mark the site so others do not crash into the downed person. This may be done by sticking available skis tail-down in the snow so they make an X pattern--if the snow is not too hard; otherwise laying them in a V upslope or having someone stand there waving arms if necessary. If a snowboard, place it upslope of the downed person. These are standard distress signals that are recognized by ski patrols. Most ski areas have slopeside emergency phones, and someone may go to one to report the injured party. That person should also report the location of the incident by position on a named trail or by reference to a lift tower number, the nature of the injury and condition of the injured if known, and the age, gender, clothing colors, whether a skier or boarder, etc., that would help ski patrol bring the right equipment to the right spot. Cell phones may be useful if within a service area, and if ski patrol phone numbers have been recorded in advance. If a uniformed ski area employee is passing, flag him or her down to get their advice or assistance, but not all will have radios or first aid capability. Get up soon if you go down but are not injured: Others will then not be alarmed and come to your assistance needlessly. If you can't get up right away but are just shaken, move your arms and legs and wiggle around as soon as you can, for the same reason. Check others' faces for signs of frostbite: On cold or windy days, check for ivory-colored flesh and warn if you see it, as the involved person may no longer feel the problem and of course can't see it. Smooth out holes in the snow that you create: In soft snow, a fall can make a trap for others, so smooth out any that you make or come across. Don't make yellow snow: Use building restrooms, or if desperate get well off the ski run. A corollary is "don't eat yellow snow", or any other. Respect all snow sliders: Share the slopes with other skiers, racers, snowboarders, telemark skiers, snowbladers, snow bikers, etc., and be aware of the ways they use the slopes. Know, for instance, that snowboarders have a semi-blind spot behind them as they stand on their boards sidewise, that the single board may not be maneuverable as quickly as two skis which can be twisted, tilted, or stepped independently. Be aware that boarders need speed to cross flats (try not to get in front of them when they need momentum) and that they cannot step around you if both you and they are stopped, so slip to the side. Give handicapped skiers extra room; they may not be able to turn and stop as quickly as you. Be aware of race courses: Ski racers make turns around poles (called gates) stuck in the snow in an arrangement that may be widely spaced or in close groupings. The poles may or may not have banners at the top, and may or may not be in pairs. And they may be only foot-high "stubbies". Should you see such a pattern, do not cross the curving line that connects the poles without first stopping to see if a racer is coming. If a race official is nearby, ask permission before crossing; or if watching the race, ask where you should stand or stand where you see others standing. If you want to run a practice course, first ask permission from the coach or other person in charge. Often courses are set just for a team or other group who has made advance arrangement, including payment, for the privilege. And because each run down a course uses up its life, and because course runners--especially inexperienced runners--may knock poles down requiring maintenance and possibly even causing injury, a request to run a course may not be granted. Some ski areas do have courses where, usually for a fee, courses may be run; inquire. Be aware of terrain parks: Many ski areas now groom areas of snow into rolling mounds and half-pipe shapes, sometimes quite massive, and provide rails, teeter-totters, barrels, etc.. These areas are used for jumping and special tricks. Terrain parks may be open to both skiers and snowboarders, and if so skiers are welcome to use them under stated conditions of risk-taking sometimes posted at the entries to such parks. If there are other persons present, wait your turn before dropping in to a terrain park feature and then announce your inent, "Dropping in". If jumping into an area you cannot see, have a spotter ensure it is clear and flag you or at least check to be sure the last jumper has come into vision below, then clear landings and runouts yourself when you go. If viewing the park as a spectator, stay in safe places out of traffic. Ski around ski school classes: This applies not only when they are standing, but also while they are moving. In learning new maneuvers, they may be moving in unusual patterns and trying unfamiliar movements, so give them room and do not cut through their "snake lines". Place unused skis upright in the snow or in a ski rack: Leaving them laying on the snow clogs the area for others, or, worse for you, makes them hard to see and might result in someone running over your skis. In heavy snows, skis have gotten buried and lost due to laying them flat on the snow. Keep profanity and obscenities to your own group: This assumes your group is O.K. with that. Ski racers, for instance, can be and have been disqualified for violating this rule during competition. Litter goes in the trash receptacle: This applies to your litter and also that of others that you pick up. Take found items to the resort's Lost and Found Service: Some services allow you to request the item if not claimed by an owner after a period of time; owners may opt to give rewards. This "Skiing Ethics & Slope Survival" page last modified 11/03/2017 07:21:39 AM. Did you come here from a link on another website? For latest version of this page, copy to your browser: http://www.SkiMyBest.com/skiethic.htm. Copyright © 2013, 2014, 2015, 2016, 2017, 2018, 2019. William R Jones.